PPM Season 4 is here! WEEK ONE in PPM League action features the return of Johnny Briggs, our Season One Champion, and he wasted no time getting in back in the saddle. 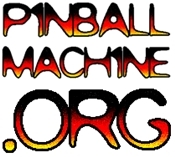 Stacey Miller and Alissa Albert played off in the side competition on Super Jumbo, the first production multiplayer pinball ever made, and Stacey won a PPM T Shirt. Leagues meets each Wednesday at 7 PM and Museum entry is just $10 for league players. Come join us anytime. Attend three league nights to qualify for Finals.